I'm blown away that nobody has posted the about the 10% discount on CampBX trading fees available through their new affiliate program. If you registered before the affiliate program started, email them, and they will get you the discount. (At least, they did it for me). Their website claims they will disable your affiliate link if people complain that you are spamming it everywhere, so don't do that. I've posted a lot of TradeHill affiliate links, but I try to not be spammy about it (I focus on articles talking about bitcoins that don't tell you how to buy them). I can tell you it doesn't make much money (usually just a fraction of a penny when somebody places a trade), but it is kind of fun to promote these new technologies. Keyur, will you give people a way to see how many have signed up from their referral links, and way to see how much they have earned from referrals? I like how TradeHill does it, even though it is a bit depressing to see how little money comes in that way. That's because there's a whole separate thread for it. Especially with short trading, I would like an API for this. An API is in the pipeline? Yes it is! We are planning to launch API at the end of first month. When will EUR deposits / withdrawals be available? Instant bank wire, PayPal, moneybookers and espacially the use of Paysafecard (European version of cashU) would also be very nice. Can you add a feature that will send you an email anytime an order has been executed (optional)? OK, I find this slightly confusing. Yesterday I sent 5 BTC to CampBX, and put in two sell orders, one at $14.75 for 2.5 BTC and another at a much higher price for the rest of it. The deposit BTC transaction looks pretty obvious, except for the fact that the times are completely different. The sell transaction also looks fairly obvious. The extra withdraw BTC transaction is confusing for several reasons. Since I already had 2.5 BTC sold via the sell order, why show an extra transaction? After seeing this transaction, I had to go check to see whether my account got hacked and my BTC stolen, because that's what it looks like. (Fortunately it was not.) Also, why are the times so different - is there some timezone handling problem? When did this sale really take place? The BTC transactions estimates the times when you check your balances on Camp BX. So timestamps may be off by a while depending on how often you check your balances. Improving time accuracy is already on our tweaks list. Users like to slice and dice the CSV timeline according to personal preference, so we show extra / sub-transactions in our records. Sell/Buy orders and Deposit/Withdraw transfers show up as distinct records. This behavior is of course customizable, and if there is enough demand from users to mask sub transactions we can easily do that. Element - we are looking in to adding this feature. In this case, I think it could be made more clear in the display that the transactions are linked. I also think that there are still some timezone issues here, which I didn't see you say anything about. We have re-worded the records to say "BTC Deduction", which should hopefully alleviate the confusion caused by words like "BTC Withdrawal". Timezone display are certainly an issue - plan is to let users pick their own timezone in profile and then format the stamps accordingly. Will keep you posted as we get close to pushing this in production. speaking of, it appears that withdrawing bitcoins from your balance incurs a fee? is this correct? I have tested the site a bit, and have a few improvement suggestions. When I do a preview order and it fails (Insufficient funds), sometimes (50-80%) I get no message I am just returned to the site. Should make the buying easier, right now I have to use a calculator to find out how many bitcoins I can buy. Also I have to calculate the commision fee. So I needed like 10 attempts to get the right amount. Another thing I hope you guys are planning on is fixing the graphs, and market depths a bit. It is pretty annoying, not as bad as tradehill. But the graphs feels useless (maybe because it is so low volume) but the market depth I have to refresh the page and scroll down to see. PS: I have a buy order at 14!! Just a quick note, I did a Dwolla transfer and it took 25 minutes. I hope you plan to do a better integration of the Dwolla API in the near future. Took my transfer about 10minutes when I did that. 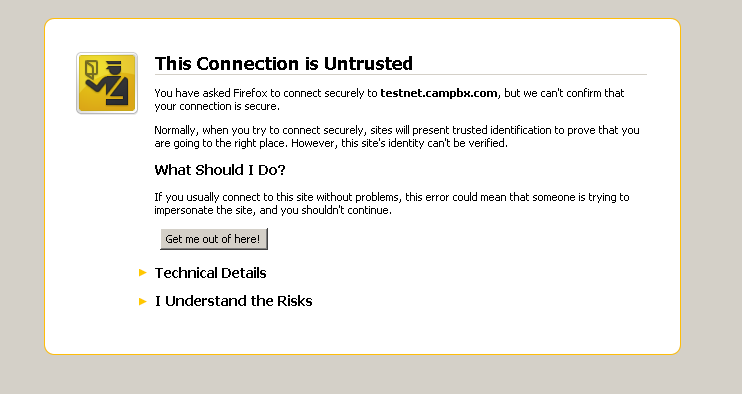 FYI: This is what I see using firefox 3.6 and clicking on the testnet.campbx.com webpage. TeraPool: Please use the link https://campbx.com/testnet/ instead. Our old SSL certificate has been replaced, and that's why you will get a warning from the browsers. On another note I congratulate CampBX on making to the top10 today at http://bitcoinwatch.com/ !!! !